Soak woodear mushrooms in cold water for 15-30 minutes to rehydrate. Drain mushrooms and boil for 2 minutes. Drain and leave to cool. Mix ginger, lime juice, soy sauce, sesame oil, sugar, and chilli in a bowl. 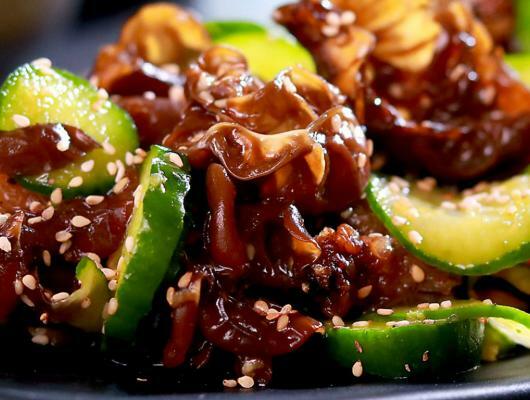 Toss in sliced cucumbers, cooked mushrooms, and sesame seeds. If you’re struggling to find wood ear mushrooms then Oyster mushrooms would be an excellent replacement. Also you’re buying them fresh, then instead of boiling, blanch them by dropping the oyster mushrooms into boiling water for 30 seconds to a minute at the most, then submerge them in an ice bath to stop the cooking process. The glossy look of this salad is not only pleasing on the eye, but contributes perfectly to a balanced diet. Wood ear is known for its ability to reduce cholesterol in the body, aid blood circulation, and improve melanin and keratin efficiency too. Cucumber will not be left behind as it can also help in weight loss, hydration, is good for eyesight, among other benefits. And if you take a look at the other ingredients, sesame seed, ginger, lime etc. you should definitely add this to your recipe book! Let us get into its preparation without further ado. Shall we….